This example of a female body changed by masturbation is a video produced some time ago. After being available for a year or two on Youtube the video was suddenly banned because of an organized complaint campaign by people with a vendetta whose goal was to get Happeh banned from Youtube completely. Because of that situation, the link below will download the video to your computer for local viewing. A webpage duplicate of the video is also provided for those who prefer to read. This video is example number four in the series “Masturbation will make you blind and crippled”. Here is the example picture. The exaggerated pose this woman is holding highlights the damage caused to the body by masturbation. The woman’s right hand is in her underwear. It is reasonable to claim that the posture of the woman’s body right now in this picture is influenced by the act of masturbation. According to Happeh Theory, one of the major symptoms of masturbation is uneven shoulders. 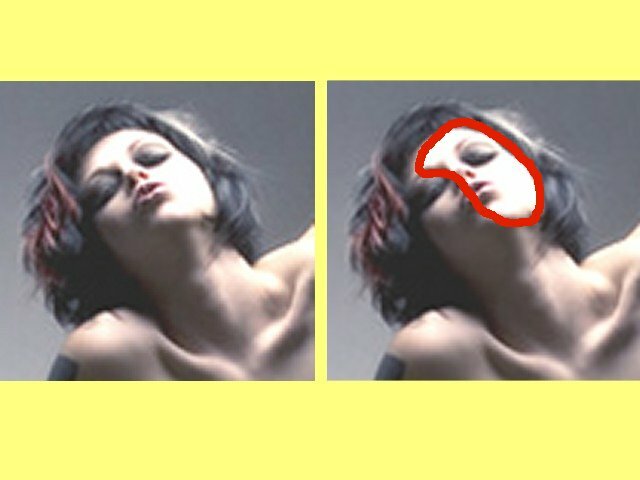 The woman’s right shoulder is lower than the left shoulder as highlighted by the lines in this picture. Another one of the major symptoms of masturbation is arms that appear to be different lengths. The woman’s right arm looks very long while the left arm looks very short. Masturbation will make the hips uneven. The woman’s right hip looks larger and higher than the left hip. The woman’s entire torso is curved to the right, as highlighted in this picture. while the right shoulder is trying to reach down to touch the hip. The woman’s head is tilted back to her right rear. in contrast to the left side of the face which looks large and bright. According to Happeh Theory, Masturbation will make you blind and crippled. The woman’s hand is in her pants so we know she is masturbating. Her right eye is small and dark. Her head is twisted and tilted. Her entire body is curved to her right. Her arms look as if they are different lengths. Her shoulders are not level. And her hips are not level.